Just kissed her for the last time and last time her face was wet with my tears. Baby Monster with her best friend, baby Barrycat, in my disgusting chair. He was 3 years younger than her but she was so small and he was so big that he outgrew her almost immediately. 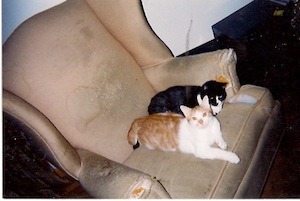 When he died, very young (he was only two), she mourned, it was heartbreaking, I was mourning too, but how to comfort a cat? She would look for him all over the apartment crying, she lost weight, she licked her fur off, she needed to be held all the time. I had to give her kitty antidepressants, which was obviously pretty ridiculous but you will do whatever when you see so much pain. They kept telling me to get another friend for her but I wouldn’t, I didnt ever want to go through that again, but finally I did. We named him Fritz Newman, and he is great comfort. I do a lot better with animals than I do with people.